Gary Dzen has covered one Celtics championship run and one 18-game losing streak. He was there for Belichick's 4th-and-2. He really, really likes IPAs. Update, Nov. 12: The Alchemist announced on its blog that it plans to open a new retail space in early 2014. Some big beer news out of Waterbury, Vt. Tuesday: The Alchemist, brewers of the No. 1 beer in the world (according to the rating website Beer Advocate) "Heady Topper", is closing their cannery to the public, effective Nov. 15. The Alchemist posted this statement on their website. From the very first canning run of Heady Topper we have experienced a level of support and growth that none of us could have predicted. We had hoped our location at 35 Crossroad would be capable of handling the traffic, however with growth comes growing pains. In an effort to stay ahead of the curve we have made the difficult decision to close our retail shop and self-guided tour area. Effective November 15 the cannery will no longer be open to the public. The good news is this will not affect our production levels. We will continue to distribute to all our current accounts but we are not adding any new accounts at this time. Alchemist and Heady Topper merchandise is available at our online store that we will be enhanced in time for the holidays. Thanks for your continued support and patience with us during this transition. The support of our local community and the beer community as a whole has been both overwhelming and inspiring. As soon as we have further information, we will share it with you so please stay tuned for updates. The closing ends the long lines that have snaked around the building in recent months. For a while, you could show up to the cannery and buy a case of the aromatic double-IPA almost whenever you wanted. The beer began to sell out on weekends, then Friday mornings. As the beer rose to No. 1 on Beer Advocate, it began selling out on other days. Driving to the cannery and securing beer was no longer a sure thing. Before the rise, I captured the phenomenon as best I could in a piece for the Globe Magazine last September. I reviewed the beer, and I reported on how once-planned shipments to Boston might not happen after all. What does the change mean? 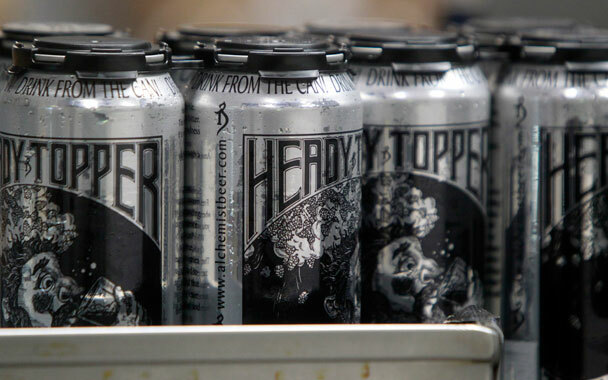 You can't buy cases of Heady Topper at the cannery anymore, which is bound to make some folks -- especially those used to buying it in large amounts -- sad. You may, however, be able to drive through Vermont, stop off at a liquor store, and pick up a Heady Topper somewhere else. Waterbury is still worth the trip, in my opinion, for the ability to drink Heady as well as beers from Lawson's Finest Liquids, Hill Farmstead, Zero Gravity, and other local breweries at the bars in town. It is still very much a haven for beer nerds. Here's hoping the change is a positive one for consumers. Do Chardonnay Grape Seeds Hold a Slimming Secret?